Third Entry: Crystal Bandit Female (AKA a Mountain 'dog'). This beast hails from the same planet as my Merchant race. 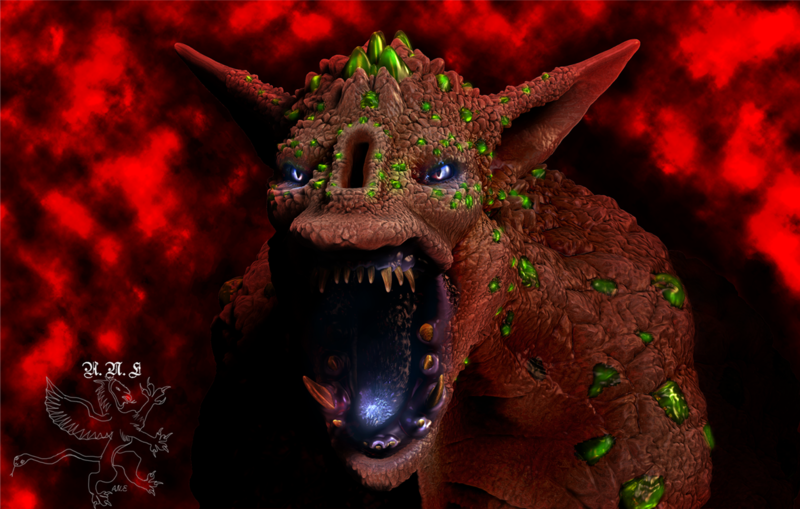 These 'dogs' live in the caves found in the mountains, and actually grow crystals and living rocks on their bodies due to living in heavy mineral areas. 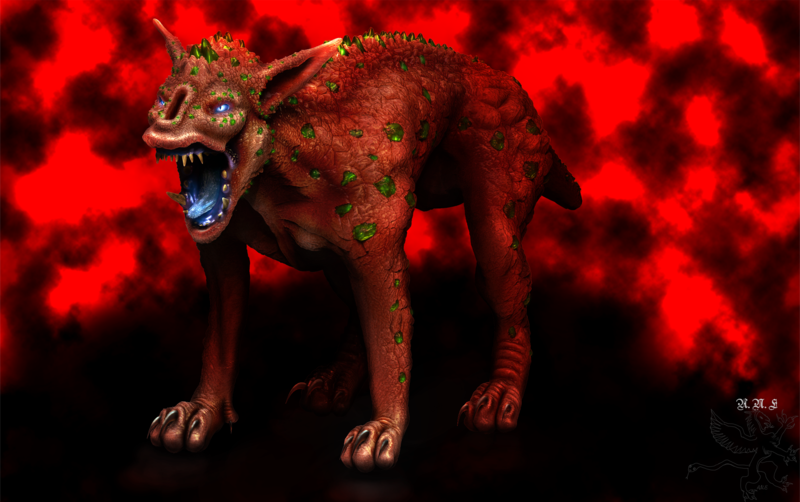 These interesting additions to the animal's skin will eventually kill them as the rocks and gems become too heavy for the creature to carry and some poisoning of the blood is not uncommon. The Merchants catch the Bandits at a young age and therefore can keep them alive much longer than they normally live in the wild, as the rocks and crystals do not have a chance to attach and grow. They are called Bandits because they tend to be a bit of a pest, running off with livestock and small children quite often when they come near a Bandit's den. 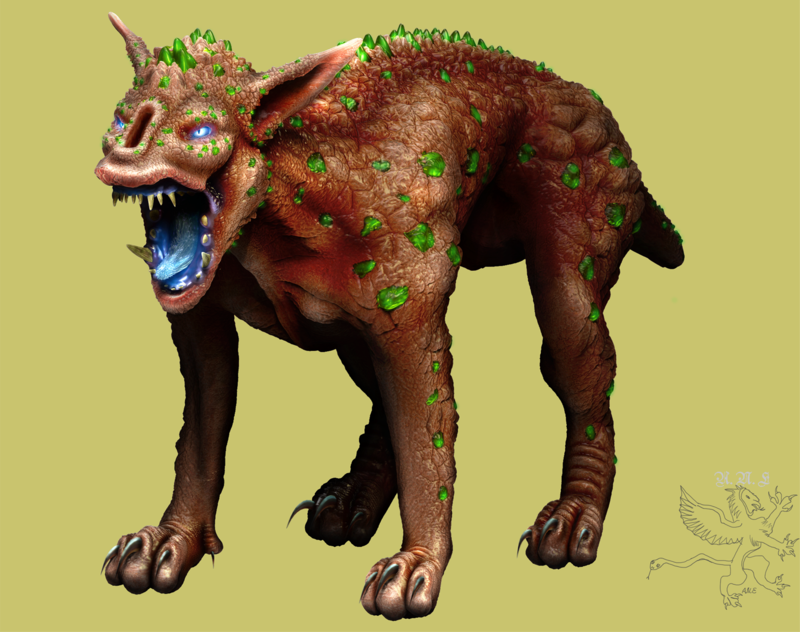 Bandit young are called Whelps and do not get the glowing effect to their tongues until they reach maturity. The glowing is not only to attract a mate but also to help attract food in the dark caves. They have a single nostril on their face very much like a blowhole, that will close when they fish in the lakes or dig in dirt or sandy areas. Bandits live in large packs and are very much like earth elephants, with the eldest female becoming the Matriarch and males being tossed out when they are old enough. Males and females look the same, except the females are bigger than the males. Bandit males can reach up to four feet in height at the shoulder, with females being a half foot or more taller. The Female pictured is being kept in a force-field cage while being shipped off world for trade. Added so that more detail can be seen of the model.